Product prices and availability are accurate as of 2019-04-19 05:45:52 UTC and are subject to change. Any price and availability information displayed on http://www.amazon.com/ at the time of purchase will apply to the purchase of this product. Special super efficient 25' copper immersion style wort chiller design keeps the coils elevated in the kettle where they are most effective. It reduces the chance of infection and exposure to the environment. 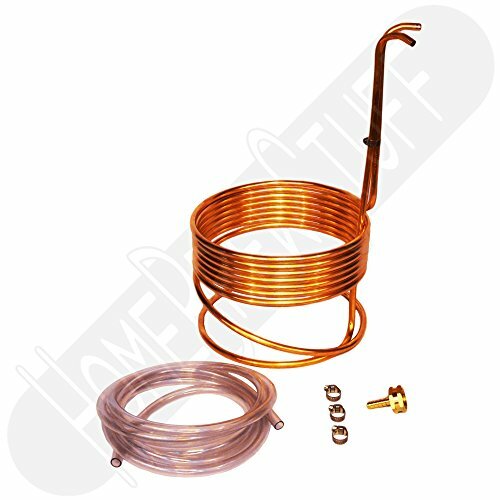 Copper is the material of choice for wort chillers. Copper has up to 28 times the thermal conductivity of stainless steel . So while we all love Stainless Steel, Copper is clearly much more efficient, and has the added benefit of imparting trace minerals into your beer that are beneficial to yeast .Thermal conductivity calculated by (Btu/(hr. °F ft.)). This immersion chiller is designed for 5 gallon batches, and will cool your wort in minutes! 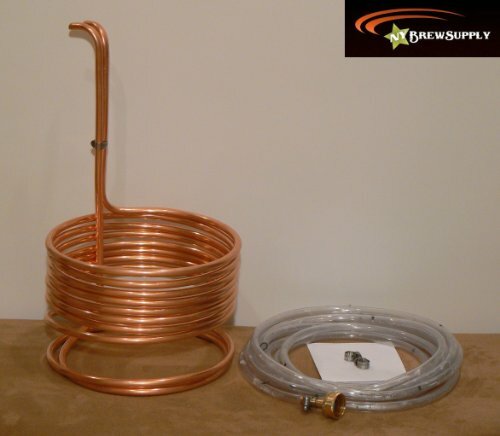 It's made from 25 feet of 3/8" copper tubing which provides the most efficient and perfect balance of heat transfer and flow rate, allowing you to cool your wort and reduce the amount of wasted water. Complete care and use instructions are included.